I am unqualified to write Ron Hruska’s career biography. I am only his daughter, and sadly, not privy to his world of biomechanics and pathokinesiology and postural restoration. Honestly, I’m not even sure what those words mean. As far as his professional expertise goes, I can only attest to this: my dad has X-ray vision. He can watch you walk or sit or stand and know exactly what is going on inside your body and how it needs to be “fixed.” Coming from his most apathetic patient ever, I’m pretty sure this means that for at least the last decade, he’s had to bite his tongue every time he watches me move. There are hundreds, thousands probably, who can speak of his love and passion for his profession and of his dedication to helping people move and participate more fully in their own lives. Adjacent to this devotion to others, though, there is in him the desire to fulfill the potential of his own life and embrace the goodness he himself has been given. It means that when he is not practicing PT or teaching courses, he is, well, busy with other things. To just list all of my dad’s hobbies is an injustice to the depth and breadth of his interest in and knowledge of them. We call him obsessive compulsive, but passionate seems a more respectful adjective. My dad is an arborist and a gardener. A daVinci enthusiast and Husker volleyball fan. A collector of Red Wing pottery, oak furniture, Tonka trucks, toy tin barns and model and full-size tractors. A fisherman and hunter. A wordsmith and lover of books. And sometimes, late at night, an E-bay bidder. 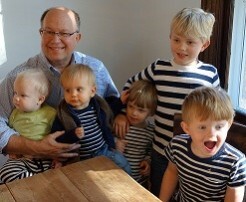 Above all of this, he is a husband, dad, and most devoted grandpa. He cannot go more than a couple of days without seeing my four boys and does everything in his power to make sure it happens. He also fosters in them enthusiast tendencies that mirror his own wholehearted passion for partaking in pleasurable pursuits. Once he learns of their interest in playing army, or of building with with Legos, or most recently, of their obsession with Star Wars, there will be hundreds of plastic army men and tanks or new Lego sets or Darth Vader costumes in their hands the next day. Let’s call it what it really is – spoiling them. I think he considers it his most important job. Ron graduated with a Bachelor of Science from the University of Nebraska Lincoln and matriculated to the University of Nebraska Medical Center, completing a degree in Physical Therapy. Following graduation from Physical Therapy school in 1980, Ron accepted a position as a staff PT at the Omaha Veterans Administration Medical Center. In 1983, he was promoted to Assistant Chief and Clinical Educator. During this time, he also earned a Masters of Public Administration through the University of Nebraska, Omaha. In 1984, Ron accepted a position as Director of Physical Therapy and Rehabilitation at St. Elizabeth Community Health Center in Lincoln, Nebraska, where he served in this role until 1997. In 1997, he began working with Inverse Technology Corporation as Director of Clinical Services. During this time, Ron was teaching courses across the country on “Patella-Femoral Dysfunction and Protonics”, as well as the first Postural Restoration® courses. 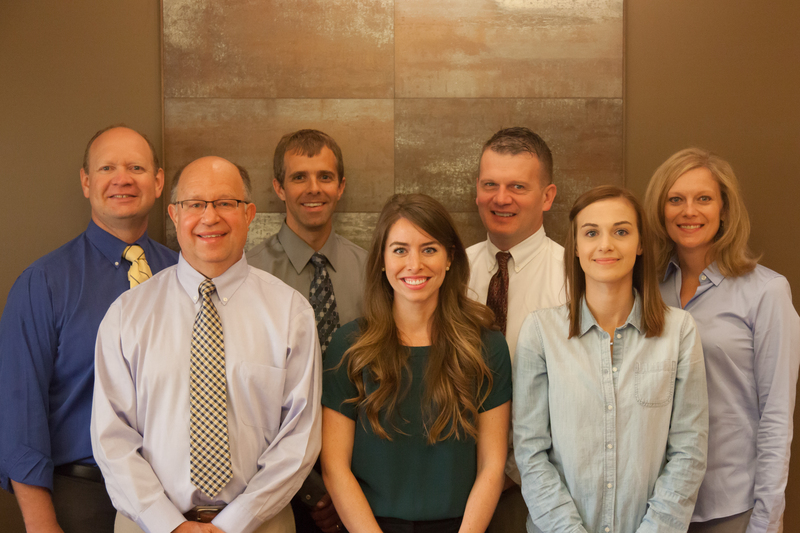 In 1999, Ron opened the Hruska Clinic Restorative Physical Therapy Services, in Lincoln, Nebraska. In 2000, as a result of his extensive clinical and professional experience, he established the Postural Restoration Institute®, to explore and explain the science of postural adaptations, asymmetrical patterns and the influence of polyarticular chains of muscles. In 2011, Ron co-founded PRI Vision, LLC in Lincoln, NE with Dr. Heidi Wise. Ron has developed a strong interest in myokinematic, biomechanical, occlusal and visual influences on postural and peripheral adaptation patterns. Over 35 years of clinical experience assists him with direct patient interventions based on specific examination and evaluation data that best reflects neuromechanical stability, trunk symmetry and respiratory balance. In his earliest clinical practice at the Omaha Veterans Administration Medical Center, he recognized asymmetrical patterns that were influencing posture and movement, which led to the beginning of the science which is now Postural Restoration®. He lectures extensively and consults regularly with physicians, physical therapists, athletic trainers, optometrists, dentists, and other health care and fitness professionals across the United States and internationally on patterned postural position and pathology and his approach of restoring symmetrical balance using Postural Restoration® principles. As a result of his clinical experience and interdisciplinary evidence based integration, patients and healthcare professionals travel from across the country and internationally to the Hruska Clinic in Lincoln, Nebraska for consultation and treatment. These patients are usually experiencing symptoms of movement dysfunction associated with neuro-muscular, respiratory and sensorial asymmetry. Throughout his entire career as a physical therapist, he has remained a member of the American Physical Therapy Association, where he has served on the Judicial Committee, Reference Committee, and House of Delegates. Ron has served as President of the Nebraska Chapter of the American Physical Therapy Association. He has also served on the Federation of State Boards of Physical Therapy, where he was one of five individuals to be selected on the Model Practice Act Task Force. Ron has also served on the Nebraska Department of Health Physical Therapy Board, where he was appointed by the governor to Chairman of the Board of Examiners in Physical Therapy. Ron is co-inventor of the Protonics Neuromuscular Training System. Ron has also invented and patented the Prism and Priori PRI Aquatic systems. Over his career, Ron has presented at several national and state American Physical Therapy Association (APTA) conferences, as well as National Strength and Conditioning (NSCA) and National Athletic Trainer’s Association (NATA) national and local conferences. Ron has authored articles published in journals including; Orthopaedic Physical Therapy Clinics of North America, Dental Clinics of North America, The Journal of the American Dental Association, and EXPLORE. Ron continues to consult and practice at the Hruska Clinic, Restorative Physical Therapy Services, and PRI Vision Clinic. In addition, Ron is the Executive Director of the Postural Restoration Institute®, where he continues to teach nearly 20 courses each year across the country and internationally. He also serves as a Biomechanical Consultant to the University of Nebraska-Lincoln through the Division of Athletic Medicine.